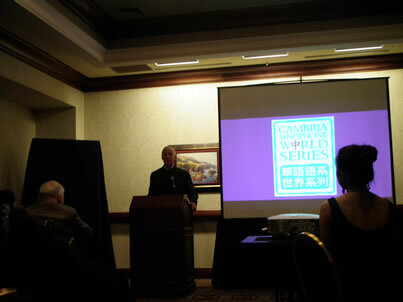 WATCH THE THIRD SEGMENT OF THE Cambria Press Sinophone World Series RECEPTION! Cambria Press Sinophone World Series Reception: Victor Mair discusses the new Sinophone World Series titles and introduces authors EK Tan and David Schneider. This follows the earlier speeches by Toni Tan and Shu-mei Shih and his earlier discussion about Cambria Press), Professor Victor Mair continues his speech, introducing the new titles for the Cambria Sinophone World Series as well as two authors who are present at the reception–EK Tan (Rethinking Chineseness: Translational Sinophone Identities in the Nanyang Literary World) and David Schneider (Confucian Prophet: Political Thought In Du Fu’s Poetry (752–757)). STAY POSTED! Like Cambria Press on Facebook, follow Cambria Press on Twitter,and share this news from Cambria Press on Google+! 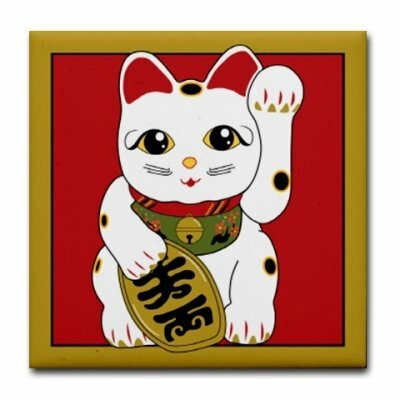 The “maneki-neko” (beckoning cats, bidding good fortune) is featured for this post, just as it is on the 2013 AAS program cover that showcases a photo taken in Shizugawa by Dr. Theodore Bestor. Cambria Press will be showcasing five new books for the Cambria Sinophone World Series headed by Professor Victor H. Mair at the 2013 Asian Studies Association (AAS) annual conference in San Diego next week! Rethinking Chineseness was published just in time for the MLA annual convention in Boston, thanks to the incredibly diligent Professor E. K. Tan who worked relentlessly with Cambria Press to accomplish this. The book is being extremely well received and has been lauded by top Sinophone studies experts, including Shu-mei Shih, the scholar who is widely credited for coining the term Sinophone and is on the Cambria Sinophone World Series editorial board. Professor Jonathan Chaves (George Washington University) praises this book for being “the best study of a single Chinese poet I have seen in decades. And the best study of Du Fu known to me.” He further adds that “David Schneider goes beyond previous works in revealing what might be called the source of Du Fu’s gravitas” and “gives us some of the very finest translations of Du Fu we now possess.” This book has been published just in time for the 2013 AAS annual conference! Not a work of literary criticism in the conventional sense but rather a cultural/ideological critique, this book by renowned critic Liu Zaifu is the first to focus exclusively on how the harmful cultural values of the two classics are received and reinforced in contemporary China. Drawing draws inspiration from May Fourth intellectuals, particularly Lu Xun, and from a wide range of works by Western scholars, Liu Zaifu engages in cultural comparison both implicitly and explicitly and poses critical questions about modernity and modernization. This is a highly illuminating must-read. In this long-awaited book by Nobel Prize Winner in literature Gao Xingjian, he exposes the political dynamics of so-called “modernity” in Western literature and art and how this has been enthusiastically embraced in China since the 1980s.analyses traditional and modern European and Chinese notions of fiction, theatre, and art, and elaborates on what aspects of writers and artists from both cultures have informed him in developing his own aesthetics in narration, performance, and the visual arts. This extremely rewarding and thought-provoking read throws open how literature and art as a creative human pursuit should not be demarcated by national or cultural boundaries. Not surprisingly, this book was a huge hit at the MLA, and sessions with Gao Xingjian and Mabel Lee were packed. Some of these titles were recently launched in January at the MLA annual convention in Boston. See Cambria Press authors Nobel Prize Winner in Literature Gao Xingjian and Professor E. K. Tan with their newly published books and watch the speeches given at the MLA reception for the Cambria Press book launch of Gao Xingjian’s book! 1) A 30% discount is being provided for AAS members and their institutions until April 30, 2013. Use web coupon code NobelGXJ. Libraries can use this too. You can also pick up a book list and order form at the Cambria Press booth (#201). An online version of the booklist will be made available soon too. 2) A booth sale special—$40 on ALL titles for purchases made at the Cambria Press booth (#201) in the AAS exhibit hall! 3) A lucky draw will be held for a complimentary copy of Gao Xingjian’s latest book (Gao Xingjian: Aesthetics and Creation) signed by Gao Xingjian himself! To enter this draw, all you need to do is drop off your business card at the Cambria Press booth (#201) at the AAS exhibit hall! Spread the word! Like Cambria Press on Facebook at http://www.facebook.com/CambriaPressAcademicPublisher and share this link http://wp.me/p1WqrY-k0 on your Facebook page! See also outstanding reviews for other Cambria Press titles in Asian studies! STAY POSTED! Follow Cambria Press on Twitter, like Cambria Press on Facebook, and share this news from Cambria Press on Google+! Cambria Press author Professor E. K. Tan and Cambria SInophone World Series editorial board member Professor Shu-Mei Shih with his new book, Rethinking Chineseness, at the 2013 MLA annual convention in Boston. Among the scholars praising Professor E. K. Tan’s new book, Rethinking Chineseness: Translational Sinophone Identities in the Nanyang Literary World, for its contribution to Sinophone studies is Professor Shu-mei Shih (UCLA) who has been widely credited for coining the term Sinophone and is on the editorial board of the Cambria Sinophone World Series. Professor Shih has praised Professor Tan’s book for being “conceptually innovative and flawlessly written.” Professor Shih was thus very pleased to see Professor Tan’s book at the MLA annual convention. Cambria Press also warmly congratulates Professor Shu-mei Shih and her coeditors Chien-hsin Tsai and Brian Bernards on their recently published book, Sinophone Studies: A Critical Reader by Columbia University Press, which will also be an extremely valuable addition to the field of Sinophone studies! E. K. Tan with his new book, Rethinking Chineseness, at the Cambria Press booth at the 2013 MLA annual convention in Boston. Cambria Press author Professor E. K. Tan’s new book, Rethinking Chineseness: Translational Sinophone Identities in the Nanyang Literary World, was published just in for the 2013 MLA annual convention in Boston. The book has been praised by eminent scholars including Professor David Der-wei Wang (Harvard University) and Professor Quah Sy Ren (Nanyang Technological University, Singapore) for furthering the field of Sinophone studies. 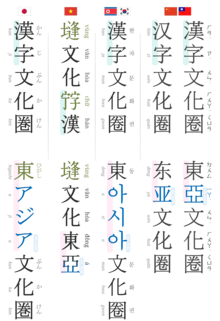 Rethinking Chineseness is in the Cambria Sinophone World Series, headed by general editor Professor Victor Mair (University of Pennsylvania). Recommend this book to your library and let them know about our value-added Cambria Press Platinum E-book Program whereby professors can obtain a FREE hard cover and students can enjoy FREE access to the abridged version (no textbook purchase required)! Regarding the origins of Sinophone, Professor Mair commented that “Within the last ten years or so, the concept of ‘Sinophone’ (obviously modeled on ‘Francophone,’ ‘Anglophone’, etc.) has come to be very much in vogue. To the best of my knowledge, the term was coined by UCLA professor Shu-mei Shih, but it was soon picked up by many other scholars and quickly became one of the hottest topics of discussion in Chinese studies.” Learn what Sinosphere means and how it differs from Sinophone by reading the rest of Professor Mair’s post. See also forthcoming titles on Sinophone studies: Confucian Prophet: Political Thought In Du Fu’s Poetry (752–757) by David K. Schneider and Rethinking Chineseness: Translational Sinophone Identities in the Nanyang Literary World by E. K. Tan. STAY POSTED! Like Cambria Press on Facebook, follow Cambria Press on Twitter, and share this news from Cambria Press on Google+!